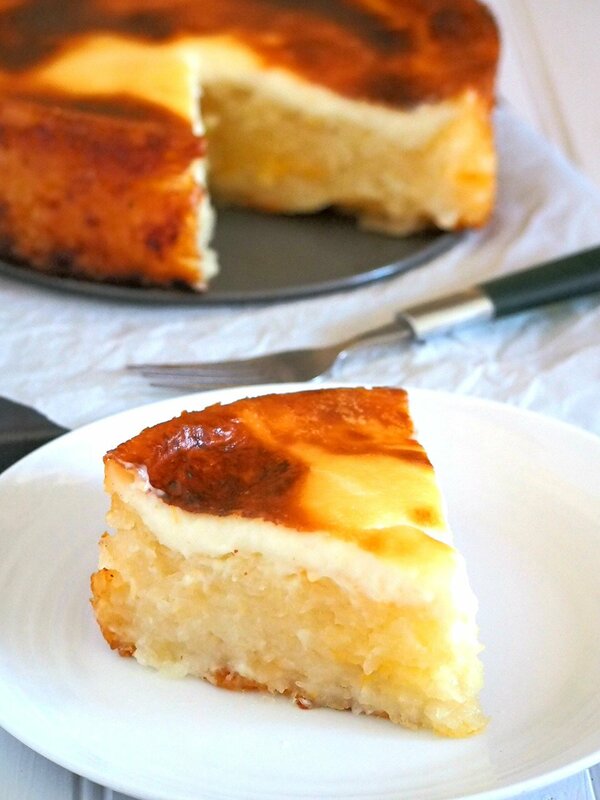 Cassava Cake is a filling dessert made of a starchy tuber, the cassava. 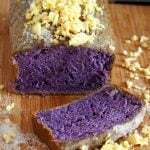 This easy to make cake is a classic favorite that is always present in Filipino gatherings. This cassava cake is appropriately sweet with notes of cheddar cheese and milk, and a whole load of the filling, tasty cassava meat. 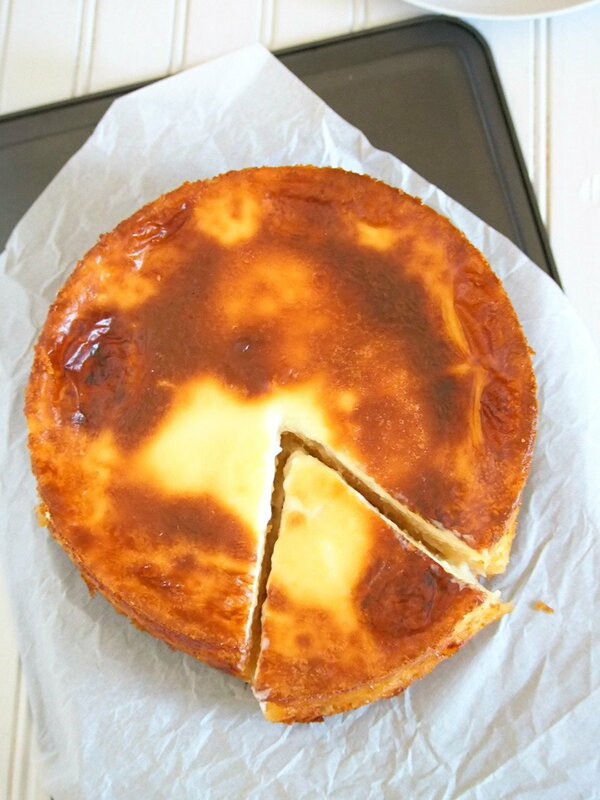 This cassava cake enticed me with it’s unusual circular shape and it’s gorgeous caramelized top. I mean, I am used to seeing cassava cake baked in rectangular or square pans , then cut into servings in bar forms. 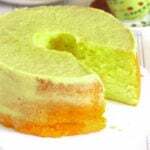 This one, though, is a slight deviation from the traditional Filipino delicacy, being baked in a circular cake pan like it is a regular sponge or butter cake. Think taro, yams and sweet potatoes. Cassava is similar to these tubers: it is a starchy root crop with its own distinct taste, but like the rest of the tubers, it is a perfect base to add flavors to, in order to yield a filling, substantial dish or dessert. Cassava can be boiled, baked, fried and steamed. This recipe calls for grated cassava. Fresh Cassava can be occasionally found in the produce section of supermarkets. They are long and brown irregularly shaped logs that vary in length and width. To prepare fresh cassava for this recipe, cut both the tapered ends of the tuber. Depending on how long the cassava is, you might have to cut it into 3-4 inch pieces just so you can hold it with ease. Hold the cassava vertically, letting it stand on your chopping board. Peel off the skin of the cassava one side at a time using a sharp knife. This skin is thick and hard. Once peeled. cut the cassava vertically in quarters to expose the fibrous, wood-like center in them. Slice the fiber off and discard. Wash the cassava pieces and drain. Using a grater, shred the cassava and either place them on a bowl if you are using them immediately, or place them in sealed bags and refrigerate for up to overnight until you are ready to make the cake. I have to admit, the shredding of the cassava is the most work you will ever do for this cake. It can take up a lot of time especially if you have little kids who need you badly after every 5 minutes ( hey, that’s me!). 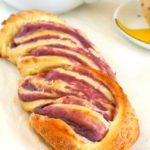 I did this step one day ahead and I recommend that you do that too so on baking day, everything is a breeze! Skip all these peeling and grating work. Buy some frozen grated cassava in Asian supermarkets. I have not done this, but it is what I am gonna do next time. Easy. Duh. 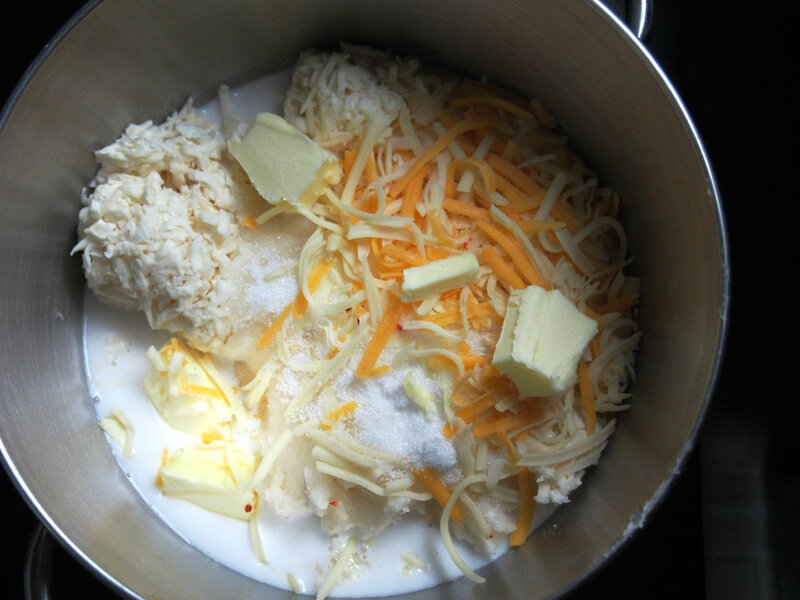 To make the cake base, you simply mix together in a large bowl, the grated cassava, the sugar, coconut milk, cheddar cheese and butter until they are thoroughly incorporated. Pour mixture into a 9-inch springform pan and bake at 350 F for 1 hour or until the cake is set. The surface should have no more liquid and there are some spots of brown on the surface. While the cake base is baking, make the topping. Simply combine flour and water until smooth, then add coconut milk and condensed milk and stir. Let this stand while waiting for the cake base to be done. Once the cake base has set, briefly remove it from the oven and gradually pour the topping mixture over the base, allowing some time for the liquid to get absorbed by the cake before pouring some more. Fill up to the brim with a little allowance so it won’t spill. Depending on how deep is your pan, you might not need all the topping. Bake cake for another hour or more, until the top has set with a little jiggle and the top has turned golden. Some spots will be darker than the others. Let cake cool completely in the pan. Loosen sides with a knife and release from the springform pan. 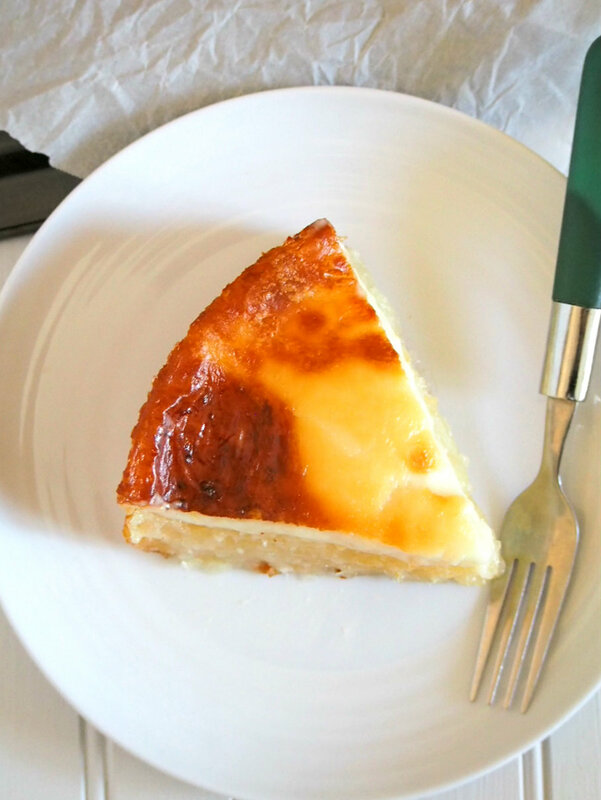 This cassava cake is appropriately sweet with notes of cheddar cheese and milk, and a whole load of the filling, tasty cassava meat. Preheat oven to 350 F. Grease a 9 inch spring form pan with butter. Mix all the ingredients for the base in a large bowl, until the sugar is dissolved and everything is incorporated. Spoon mixture onto greased pan. Make it level by pressing the surface with the back of the spoon. Bake at 350 for 1 hour or more, until the cake has set and there is no more liquid on top. Some brown spots might be present. While the cake is baking, prepare the topping. In a bowl, combine flour and water and stir until smooth. Add the rest of the topping ingredients and mix well. 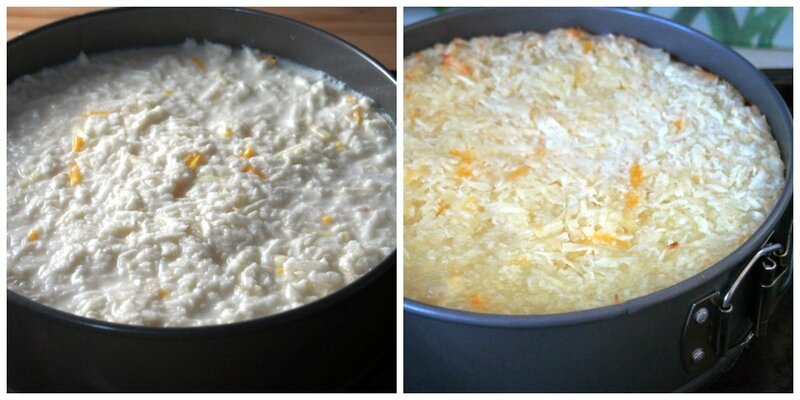 When the cake base is done, briefly remove it from the oven and pour the prepared topping gradually. Allow the liquid to be absorbed by the cake before pouring some more. Fill up to the brim, but with a little allowance so that the liquid does not spill. You might not need all the liquid depending on the height of your pan. Bake cake for another hour or until the top has set and the color is golden. Some areas will be darker than the others. Let cake cool completely in the pan. Loosen sides with a knife and remove cake from pan. Recipe adapted from Cassava Cake by Donovan Cooke from book World Class Cakes written by Roger Pizey. I live in small town rural utah hence no cassava. Can you actually substitute a yam or sweet potato for the cassava and still have it work.? This sounds delicious. Hi Yuli! It is 1000 grams. Thanks and happy baking! I have never heard of this cake. Sounds interesting for sure. I will have to see if I can find some cassava when I head into the St. Lawrence Market in Toronto. This would be a great experiment…and tasty too. I talked to someone recently about cassava! How fun that you have this glorious dessert recipe! I love desserts and this cake looks right up my alley! Delicious and pretty and I can’t wait to make it. Sweet and then the cheddar cheese, wow! I enjoy bringing items like this to gatherings so guests can really have a unique treat. 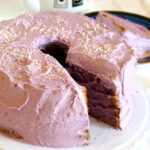 Wow – I’ve never heard of this type of cake before but it looks and sounds 100% authentic and I LOVE authentic recipes! Adding this to my list to try! I have never heard of casava cake but it sounds like the perfect summer treat!! Pinning this to make next weekend when I have some time! I have never tried this before. Looks so beautiful and delicious. Saving it for later. I love recipes that are true to your heritage! I’ve never heard of cassava, but this sounds so good! This looks and sounds delicious! I’m definitely going to give it a try! I have been admiring your cassava cake for quite some time now, it looksdj In Jamaica, we have a similar version that I great up eating. What a gorgeous recipe! 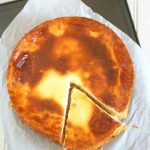 I have not had cassava but this cake looks amazing and so easy to make. I am definitely on a mission to find all of these ingredients to try this recipe! I have never had this before, but I’m going to have to try it soon … it looks amazing! I have never grated fresh cassava before cause I always used the “fresh frozen” at the Asian store. I’ve noticed that this recipe have a better texture and the little bitty cassava pieces would have a sort of a crunch when you eat it. Will definitely give this a try. freshly grated of course. Tried this recipe using fresh cassava. I used the grater with bigger holes to speed up the grating process so I had the chunky texture. The taste was really good! I will definitely make it again but I’ll be using the small hole grater to make it smoother.. and maybe top it with more cheese after baking. Grating the cassava could give me an arm workout but I’m sure it will be worth the effort! Hi Jay! You are so right about the arm work out! 🙂 I am glad you like this. Thank you very much!